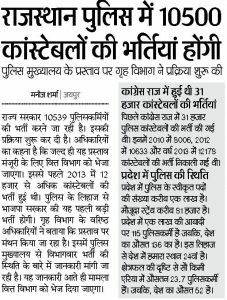 A good news for aspirants who are waiting for jobs in police constable. Recently, according to news, Rajasthan police department is going to release a notification for the requirement of the police constable in Rajasthan police. When to Apply: According to the news this vacancy official notification will out in end of July 2017. After notification, you can apply for this jobs from the official website.